FlightsFromHell.com gathers stories, including "Titanic toddler creates tumult"
(CNN) -- There was a time when airline travel was a special treat, the kind of occasion that inspired passengers to dress up. 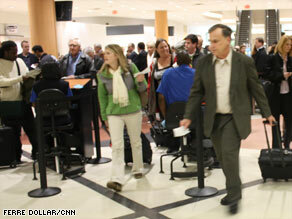 Hordes of travelers pass through airport security en route to their flights. Now, the awe people once felt about flying through the clouds is tempered by additional fees, cramped seats and horrifying tales of fellow travelers. Take, for instance, "Mr. Poopy Pants" -- a grown man who allegedly soiled himself 10 minutes into a flight from Florida to Minnesota. And then he just sat there. "We've all had our flying hell experiences," said Gregg Rottler, creator of FlightsFromHell.com. The site provides a venue for people to share their tales of woe, said Rottler. "It's therapeutic ... so it benefits them and provides entertainment value for others." Rottler, a 54-year-old environmental health supervisor in Tampa, Florida, launched the site more than two years ago. Since then, FlightsFromHell.com has attracted submissions from passengers and flight attendants that have run the gamut, touching on categories that include "odors," "attendant issues," "weird people," and "luggage and delays." Among the story headlines: "Titanic toddler creates tumult," "Wifey punched by elderly 'sleepwalker,' " and "Lip-locked tousle-haired 20-somethings." "There's something about being scrunched up with strangers ... The seats aren't that big, and once someone starts going wacko, it just creates an extremely stressful environment that was already stressful enough," Rottler said. TripAdvisor, the world's largest online travel community, recently released survey results from more than 1,500 U.S. respondents asked to discuss what about flying bugs them most. The purpose was to "allow travelers to air their grievances," TripAdvisor spokesman Brooke Ferencsik said. Sure enough, he continued, "83 percent of respondents said air travelers have gotten ruder over the past 10 years" and the most annoying travelers, earning 59 percent of votes, were "oblivious parents." Flyers griped about fellow passengers snoring, vomiting and having "excessive flatulence." But it wasn't just crying babies, heavy perfume and strangers dozing off and drooling on their shoulders that people complained about. Add-on fees were also a concern. These charges often hit when booking tickets, making particular seat selections and checking bags. Bringing a pet on board or getting food, blankets and pillows can also add fees. But 54 percent agreed on this: No airline fee is more annoying than the one to check luggage. The trend of ratcheting up fees began in late spring of 2008, explained Anne Banas, executive editor of SmarterTravel.com, an online consumer travel publication. "Everyday it seemed a new fee came out," she said. "The consumer sees it as nickel and diming." While some add-on charges have fallen by the wayside, such as U.S. Airways ill-fated decision to charge $2 for water, juice and soda, Banas believes other more universally instituted fees that are of great help to struggling airlines, including the ones for checked bags, are likely here to stay. "Baggage fees get people the most upset because it's the one that's hardest to avoid," she said. "People get upset when there was a status quo and something gets taken away." To help frustrated travelers, who become even more aggravated because the fees vary by airline, SmarterTravel created a guide to airline fees. TripAdvisor, which collaborates with SmarterTravel (both are owned by Expedia), also instituted a fees estimator, which allows people to figure out what flights will really cost, removing the element of surprise. When the company set out to do its survey, Ferencsik said, "We were curious to find out how much people were frustrated," by fees, such as the one for checked baggage. "Does it surprise them? And what are they doing to avoid it?" The fact that 19 percent of respondents said they don't check bags anymore, and 39 percent said they try their best to avoid it, was proof that they're "modifying the way they travel." But while they'll bend to deal with change, there are some talked-about fees that may be deal-breakers. Seventy-five percent of those surveyed said they'd draw the line if they were ever charged by an airline to use toilets. Does that mean "Mr. Poopy Pants" will have company? "I hope they would just choose a different airline," Ferencsik said.